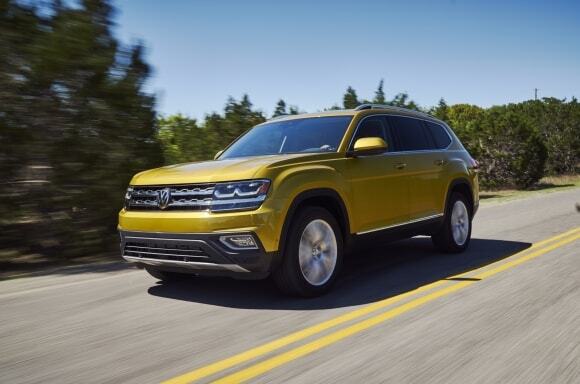 Edmunds and Parents magazine have been busy lately as they named toe Volkswagen Atlas the Best Three-Row SUV in the 10 Best Family Cars list for 2018. Derrick Hatami, executive VP of sales and marketing for VW of America (VWoA), was ecstatic about the award. He said that the automaker is “so proud to be named one of the 10 best cars for families” by Parents and Edmunds. In compiling their annual list, Parents and Edmunds looked first at safety ratings, narrowing contenders to the 109 named Top Safety Picks by the Insurance Institute for Highway Safety (IIHS). Or, they looked at vehicles that received a 5/5-star rating from the National Highway Traffic and Safety Administration (NHTSA). Also, Edmunds rated the mechanics of each of those vehicles, and Parents installed car seats and looked for family-friendly features in their 20 finalists. Introduced last year as Volkswagen’s first three-row SUV, the 2018 Atlas was, as noted, specifically for the American family. It is available with two engine options – a 2.0-liter, turbocharged for or a 3.6-liter V-6. There are five trim levels, S, SE, SE with Technology, SEL and SEL Premium. It is also available with an all-wheel-drive option, VW’s 4Motion® system. VW assembles the Atlas at its recently expanded and upgraded Chattanooga, Tenn., manufacturing facility. It carries a base suggested retail of $30,750. For more information about the 10 Best Cars for 2018 list by Parents magazine and Edmunds, please visit Parents.com/bestcars.